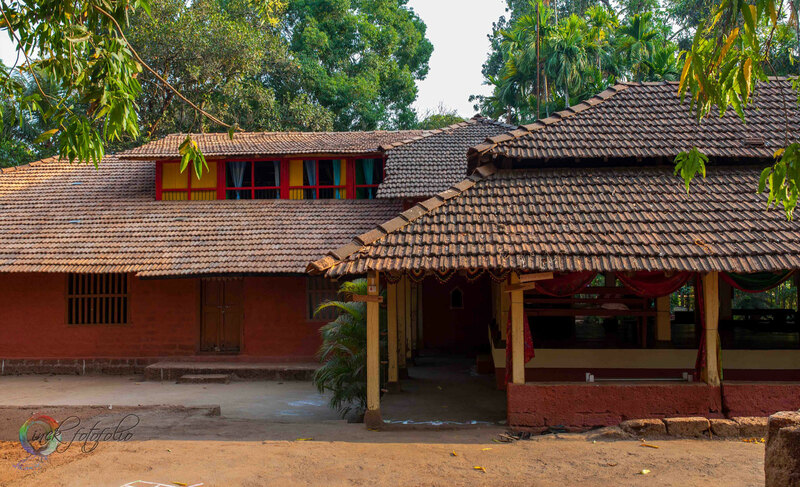 Karneshwar –( Hemadpanthi Shiv Temple) – 17 kms: Karneshwar is famous for the Temple, this temple was built 1600 years ago by Karna of Kolhapur and is one of the important places in Sangameshwar taluka. 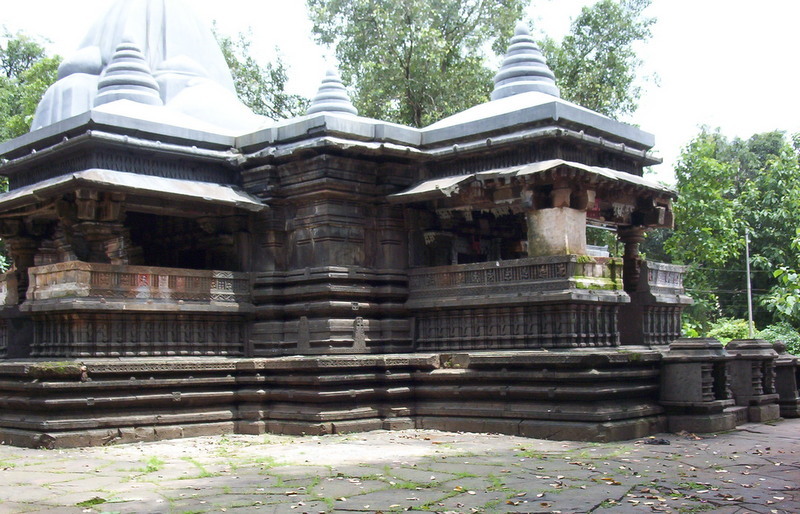 The statues and carvings of many Hindu Gods can be seen on the walls of Karneshwar temple. Mythological statues Buddhist are present in Konkan from a Long Period. In Ratnagiri district at Kadsamla ,Nonvali, Vihroli, Soprachal and Tanla, one can come across Buddhist monks staying places, statues of Lord Buddha etc. 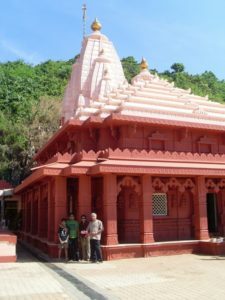 Rajawadi ( Hot Springs/ Wood carved Shiv Temple) – 9 kms: Tural and Rajwadi hot springs are on the banks of a tributary joining the Shastri river. Tanks are constructed around both the hot springs.there are two springs. The spring is also reputed to cure skin diseases and rheumatic complaints and is a good appetiser. 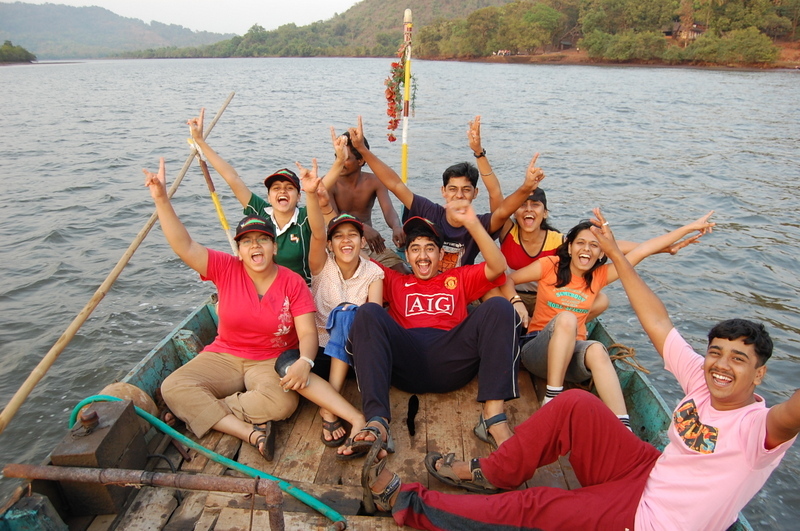 Karjuwe Backwaters – Boating – 17 kms: Karjuwe , small village in interiors of Kokan. Recently got famous because of shooting of Marathi film ‘Shwas’. This place is scenic & very good for back water boating. Marleshwar – ( Waterfall/ Shiv Temple)52 KMS : Marleshwar is very much popular for the Cave Shiva Temple where one can see venomous snakes who do not bite the devotees. 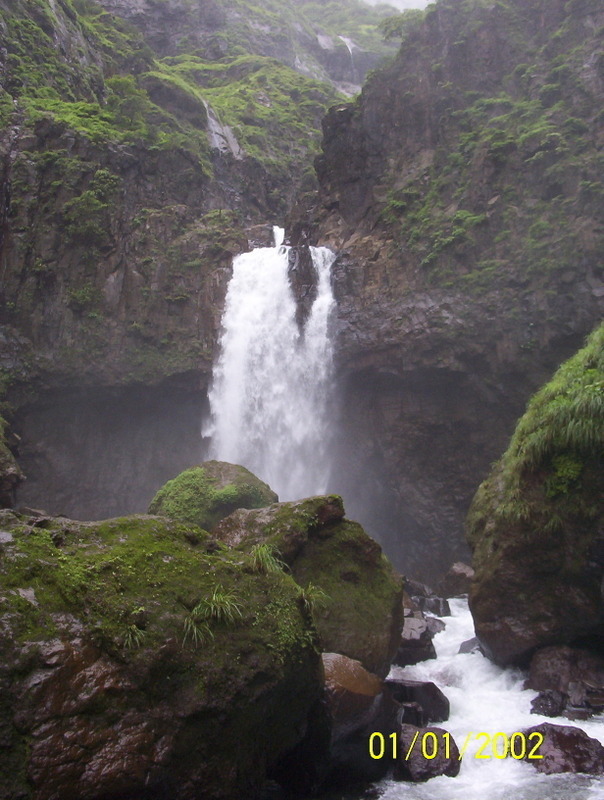 This has resulted in increasing faith in the place and every year thousands of devotees visit the place and perform ablutions in the nearby Bav river.Dhareshwar is a waterfall on the Bav river which is another tourist attraction of Marleshwar.There are many stories about Marleshwar. On the day of ‘Makarsankranti’ marriage of Marleshwar and Girijadevi takes place. At the beginning of 18th century, this ‘Shivling’ was in Muradpur, which was brought here in the cave after tyrant Muradkhan started vexing people of Muradpur. This temple is known as ‘Trambakeshwar’ of Konkan. Marleshwar name may have come from Maral village. 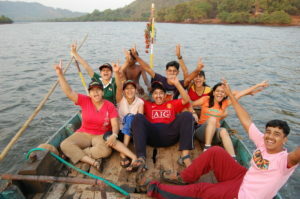 Ratnagiri – 65 kms: Ratnagiri is a beautiful city and an important port. The city is quiet industrialized and has many fish processing and exporting units. The Ratnagiri beach is a lovely beach, which penetrates the sea and you can see a White sand beach on one side and a Black sand beach on the other at the same time. You can watch a beautiful sunset at the beach in the evenings. 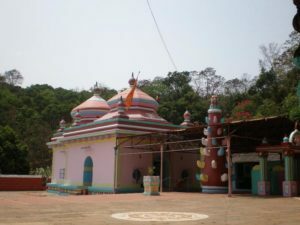 Hedvi/Velneshwar – (Beaches/Temples) – 72 kms: Hadvi is famous for dashabuja Ganpati is an excellent temple. Name of this Ganesh is ‘Dashbhuja Ganapati’. 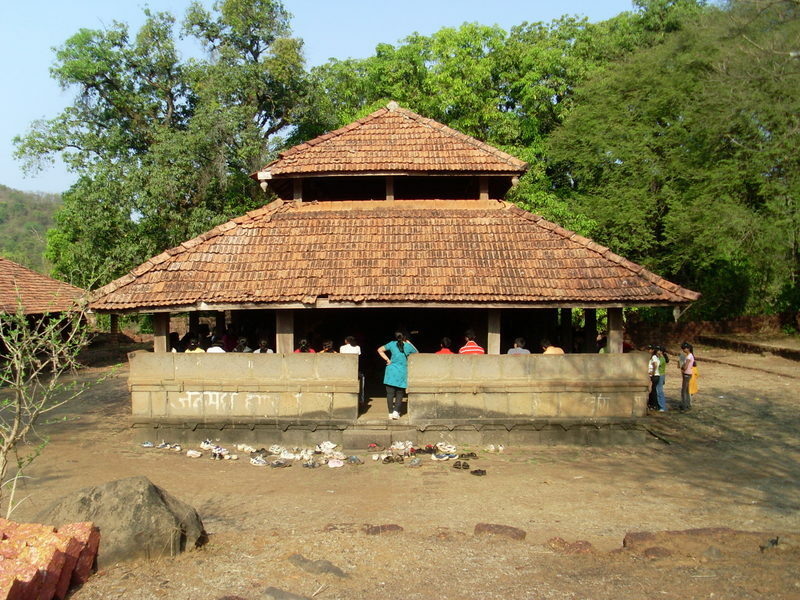 This ‘Laxmi – Ganesh Temple’ is not only ancient but also rare. 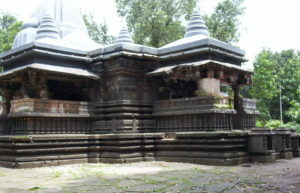 This temple may have been erected in the period of Peshwa. The deity has been founded on the top of Mountain. The Ganesh idol has been carved in white stone. Such stones are found in Kashmir region. The specialty of the idol is that it is 3 feet high and it has 10 hands. This majestic idol is on a seat of 2 feet.This idol is very charming. There is big ceremony of birth of Ganesh from Shukla Chaturthi to Shashthi in Magh. There is procession of Ganesh in chariot. The beach there is a place locally known as ‘Baman Ghal’ where the rocks have been cut by the sea, forming a gorge (Ghal). 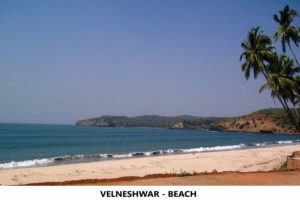 Velneshwar has a beautiful beach and an Ancient Lord Shiva Temple. The Temple complex has three four different temples and the secluded beach behind the temple is very beautiful and clean.